The first question that should be answered is whether to personalize the kippot for your wedding or bar mitzvah. 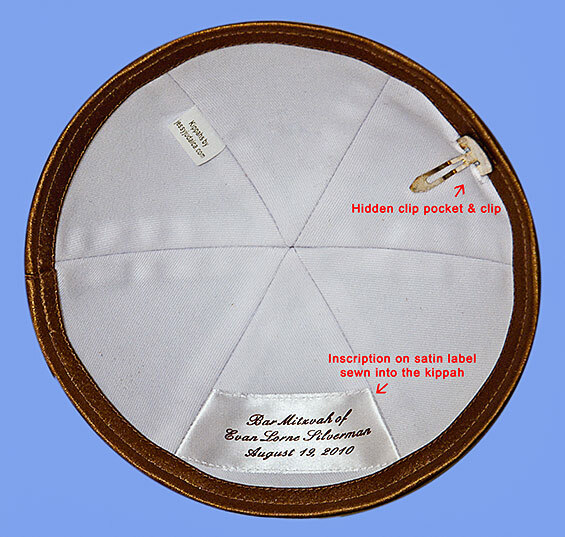 A custom inscription can be hand sewn on a label or the inside of the kippah with the name of the bride and groom (or whoever the mitzvah is for), event date, and location. Generally the inscription is a maximum of five lines and most people keep it to four lines to be concise. If you decide to order personalized kippot, you will have to plan ahead to allow the factory time to produce your order before the event. It’s always recommended to order two to three months before the event to allow for ample time. There will be proofs of inscriptions to approve, colors to match, and little decisions to make in between. If you decide to go with a stock kippah then you can order closer to the event as there isn’t any personalization to deal with. However, a customized inscription is usually free and provides your guests with a memory to take home, so why not personalize it!? But How Many Should I Order?! This is the million dollar question when ordering kippot for a wedding or bar mitzvah. As a rule of thumb, you should order one kippah for each male (both adults and boys) and add twenty five more to that number. The reason to order extra is you normally place the kippah order a few months from the event date. Guest lists can change and it’s surprising how many people end up being tacked on closer to the event. How Do I Decide On Color And Pattern Of The Kippot? Every bride has a color palette for the wedding. Every mitzvah planner will have a color theme for the event. You should compliment the event color scheme with the color of the kippah. The shade of color on a kippah can be a beautiful accessory to the entire event color palette. It is very important to be sure of the exact color shade that you are ordering before placing the order. Where To Order Your Kippot? I highly recommend ordering a sample before buying if you are not sure of the color. Search for a kippot manufacturer that offers free samples. If you already have an idea of what you want, go to Jessy Judaica to request a free kippah sample.